Rising oil prices will drag on the British economy, creating a further headwind for the already weak UK. UK economy already suffering thanks to Brexit’s impact on the pound and the wider investment landscape. LONDON — Brexit has been the main focal point of discourse around the UK economy over the last year or so. Brexit has very clearly had a negative impact on growth and the UK’s position in global growth standings. All of these negatives, if not solely caused by the vote to leave the EU, have certainly been exacerbated by Britain’s impending exit from the bloc. But, according to analysts at Pantheon Macroeconomics, there’s a fresh headwind coming to slow down the UK economy, and for once it has absolutely nothing to do with Brexit. “The recent surge in the oil price has added to the headwinds set to batter the economy over the next year,” Samuel Tombs, Pantheon’s chief UK economist wrote in a note dated November 8. Oil prices have rebounded to their highest levels in over two years in the past month, hitting $US64 per barrel this week, largely driven in the short term by political strife in Saudi Arabia, which has filtered through create concerns about possible disruption in the world’s second largest oil market. This, Tombs argues, is bad news for Britain’s already fragile economy. 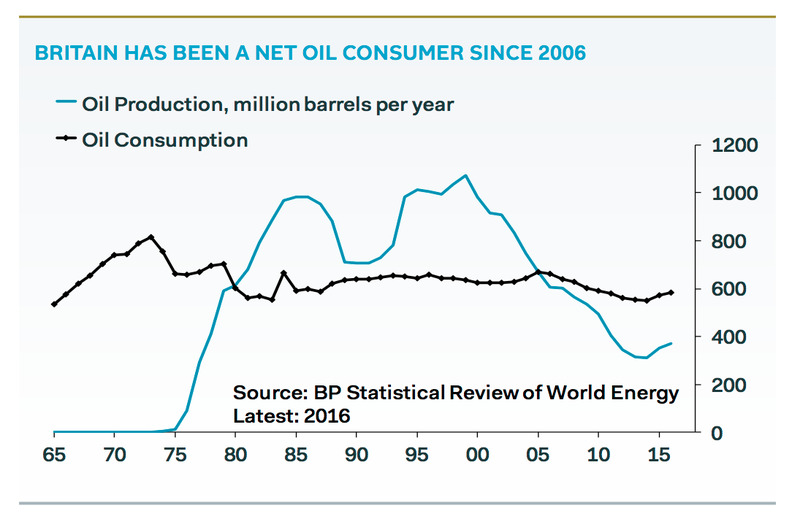 Effectively, Britain is a net consumer of oil — meaning it uses more foreign oil that it can produce itself. 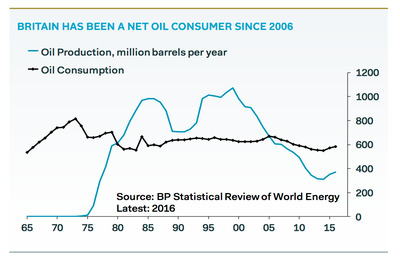 “Britain has been a net consumer of oil since 2006, because production from ageing, depleted oil fields in the North Sea has plunged,” Tombs writes. That’s because oil prices are acutely felt by consumers — the great drivers of the UK economy. “The pain of higher oil prices will be felt swiftly by consumers; motor fuel prices respond to changes in crude prices with a lag of just three weeks,” Tombs argues. 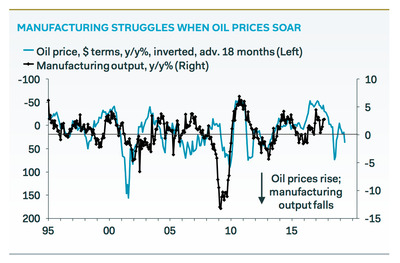 Not only will consumers be hit, but the Brexit driven revival in the UK’s manufacturing sector will also take a bashing from the increase in oil prices. Manufacturing has been boosted by the drop in the pound since the vote, as foreign importers buy more goods from the UK at knock down prices. Oil’s rise, however, could end that renaissance. 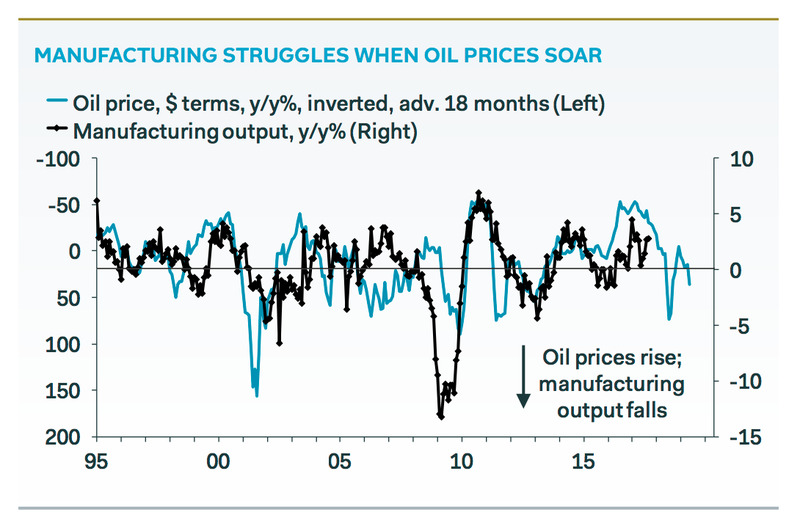 “Our second chart shows that the jump in oil prices is consistent with year-over-year growth in manufacturing output declining to about zero next year, from 2.8% in September,” Tombs says.